Rare to encounter such a darkly cynical book in photoland it is, especially one written by one of photography's leading practitioners. The fine art photo establishment a new A-hole Duane Michals rips, but without coming off as a jerk. The type of humor that B aspires to this is. The force is strong with this one. 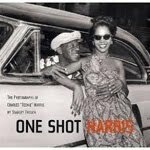 On a par with Weegee, Metinides, or any other Tabloid-style photojournalist Harris was. Pittsburg during the post-war years these pictures show. An astonishing range of subjects and styles they display, and an uncanny ability to hit the mark again and again. So good was this guy to give up photography he nearly makes me desire. Hmm. To a dark place this line of thought will carry us. Great care we must take. Somewhere between travelogue and desert mythology these photos fall. During two short photo junkets, capture some of the strange character of modern Israel Rozovsky managed to do. Or do not... there is no try. A removal from reality the strange color cast in many photos gives them. Cinematic, staged, and strangely exotic these photos feel. An arid land of tension, dust, and surprisingly verdant beauty they capture. Hmm. Yesss. My latest hero Van Manen is. Like snapshots her photos are. Fleeting. Intimate. Gorgeous. My first glance through the book found photos I thought I was viewing. Yet by her all were shot. My favorite photo book of the year this is. Why? No, no, there is no why. Nothing more will I teach you today. Clear your mind of questions. A lovely book with many nice photos but one which ultimately feeling a bit numb left me. Kauwachi cares about what, hmm? Light, hmm? Mixing photos like an iPod shuffle, hmm? A show in Brighton, hmm? If no mistake have you made, yet losing you are ... a different game you should play? But perhaps hit the mark here she has by producing a moving target, a book that to many people can be many things. Of the times a sign. It is the future you see. Herh herh herh. Traditional photo essay Chris Killip's Seacoal is, with all its trappings good and bad. Of the past this book feels a bit like something dredged, in both style and material. Yet published just last year it was. No fancy shenigans, just straight photos displayed sequentially. Black and white essay. Of a dying industry and the community dependent on it the photos tell the story. The dark side of coal this is. Shot on a Gus Van Sant movie set in Portland this was. From bushy tailed innocent to hived maniac living on the streets of Los Angeles Haymes follows Gabe. When nine hundred years old Gabe reaches, look as good he will not. Powerful you have become Gabe, the dark side I sense in you. Fear is the path to the dark side. Fear leads to anger. Anger leads to hate. Hate leads to suffering. And heavy photos. Lost a planet, Master Gabe has. How embarrassing. How embarrassing. Strange this book is. Comprise the normal first half Gossage's sharply seen photos do. And an interesting unfolding puzzle, Soth's companion piece is. Give props will I for experimenting and for coming up with a "Book" like no other. Still, face a bit of a let down, anyone expecting a true portfolio will. Tack this poster to their dorm room I'm guessing few collectors shall. In protective cover will it remain. Hmm. Yeesss. On one hand can I count the number of photography monographs which have Cliff Notes. One finger actually. As bizarre and absurd as this small pamphlet seems, quite useful it is. A study aid it is. My understanding of Fulford's monograph it enhances. A tinkerer Fulford is. An experimenter. A surrealist. Quite like this book there is nothing else. For the Suggested Reading list alone it is worth buying. An avid amateur photographer with professional aspirations was the founder of Scientology. Humanism, romanticism, photojournalism, and the worst of most other major "isms" Hubbard's style incorporates. His camera collection, life as a photographer, and contributions to photographic history this volume describes, with fawning commentary. As camp it could be dismissed if it weren't so amusing. Worth seeking out at garage sales or similar venues. Look at me. Judge me by my size, do you? Hmm? Hmm. And well you should not. For my ally is the Force, and a powerful ally it is. Life creates it, makes it grow. Its energy surrounds us and binds us. Luminous beings are we, not this crude matter. You must feel the Force around you; here, between you, me, the tree, the rock, everywhere, yes. Even between the land and the ship. The Force was strong in Maier. To be a Jedi is to face the truth, and choose. Give off light, or darkness. Be a candle, or the night. With the second edition, the mantle of candle the Aperture spinoff claims. Just when I was about to let my subscription lapse a new hope this gives me. On many long journals have I gone. And waited, too, for others to return from journals of their own. Some return; some are broken; some come back so different only their names remain. Another stride forward TBR takes to become the premier photography book review journal.